After attending the 2014 Google Geo Teacher's Institute (GTI) at the Googleplex in Mountain View, California, I have become particularly interested in using Google Geo Tools to explore the world in which we live. Whether it's using a collaborative map, analyzing visual data, researching answers to questions, or taking virtual field trips, I find it fascinating to be able to learn so much from such powerful tools. I am fortunate to have been able to travel to many different places on Earth, but there are still plenty of places that I know very little about. For that reason, I have found ways to use Google Geo Tools to digitally experience places on Earth that I am curious about. In addition, I also get to learn more about the culture and history of these locations, thereby, increasing my overall global and cultural literacy. One of my goals is to help teachers and students learn how to use these tools to explore Earth in more meaningful and relevant ways for teaching and learning. Below are some of my favorite Google Geo Tools and resources. Google My Maps makes it easy to create and share collaborative maps where users can add placemarks, calculate distance and area, import geo data directly from a Google Sheet, and visually represent information on a map. My Maps also syncs with your Google Drive to save your projects. Google Tour Builder is a great tool to use for creating presentations and telling stories. It is a perfect blend between Google Slides and Google Earth, where users can display text, images, and video while simultaneously touring places on Google Earth. Presentation mode lets the presenter navigate through the slides, or the link can be shared to allow other users to interact with the project. Whether it's the Art Project, World Wonders, or Historic Moments, you can discover exhibits and collections from museums and archives all around the world. Click on Pegman to gain access to Google Street View where you can tour inside museums and world wonders. You can even create your own galleries to share favorite finds with friends. 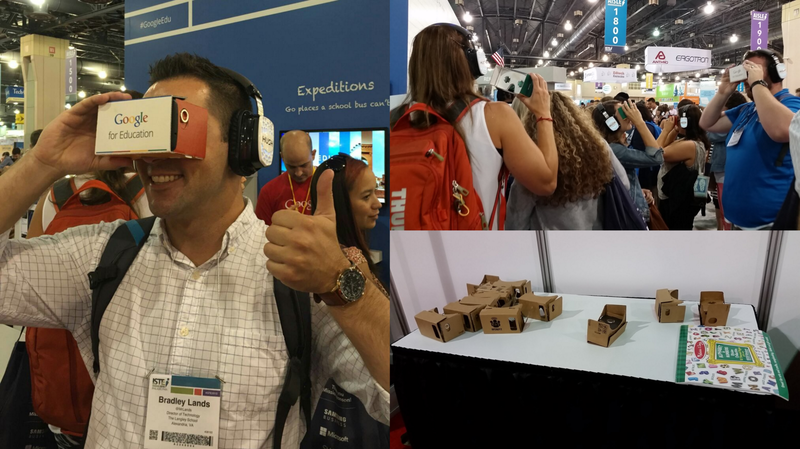 Experience virtual reality (VR) with Google Cardboard by taking virtual field trips with 360 views and narration. Explore the world or create your own 360 photos with the Street View app. Visit places from deserts to deep seas with Expeditions. And create your own virtual field trips with the Cardboard Camera app. You will need an Android or iOS mobile device with the apps installed to use with Google Cardboard. In addition, you can also take 360 photos and videos with a Ricoh Theta camera. Have you ever wanted to be blindfolded and dropped in the middle of nowhere? With GeoGuessr, you get the opportunity to simulate this experience by making observations and using context clues to guess where you are in the world using Google Street View. The closer your guess, the more points you get out of a total of five rounds. Use GeoSettr to create your own five rounds for your students to play. Also consider trying Spacehopper as a similar game that uses Google Street View. Use GeTeach to compare and contrast different Google Maps side-by-side. Choose different layers from Physical Geography (i.e. Climate) to Human Geography (i.e. Population) to ask questions and make inferences. This is also a great tool for inquiry-based learning and data analysis. Hello Earth - Let's Go Explore!